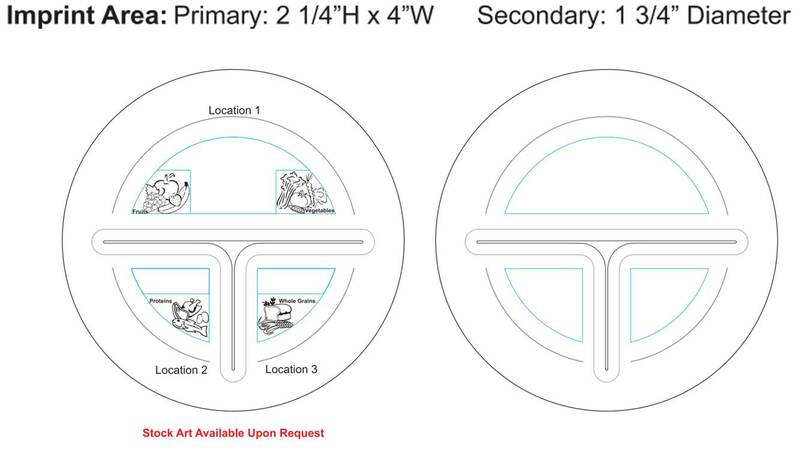 Imprint area: Primary: 2 1/4" H x 4" W Secondary: 1 3/4" Diameter Imprint on back side only. Shrink wrapped 10 pieces per pack. For individual shrink wrapping, please call for pricing. Custom portion plate is 10" Food Grade Polypropylene and has three compartments to help with portion control. The large half is recommended for fruits and vegetables, and two smaller quarters for grains/starches and meats/proteins. It reinforces balanced eating and a healthy diet. Ideal for weight conscious clientele & wellness programs. Top rack dishwasher safe. Constructed of a medical-grade plastic and available in 8 translucent colors!